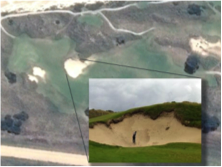 On a links course the bunkers are often just exposed parts of the underlying sand dune. When the wind blows the sand is often lifted and blown out of the bunkers. A sand blow down wind of the bunker changes the topography of the ground. The displaced sand often causes the bunker to become extremely deep. Both of these conditions change the way a hole is played, and may require considerable effort to replace the sand or restore the area affected by the blow. A course is designed to play a certain way; it is not possible to introduce a wind break upwind of a bunker without changing the way a hole is played. Directing sprinklers into the bunkers during strong winds makes the sand wet and heavy and prevents sand movement. Unfortunately that also fills the bunker with water, makes it unplayable, and very uncomfortable for a player to retrieve a ball. The combination of “Smart Watering” and player tracking allows your sprinklers to dampen the bunker but keep the hazard in play. With sprinklers operating they can be paused when a player is near, and turned back on when they leave the area. The smart watering option can be specifically configured but by default our bunker cycle will run your sprinklers for 5 minutes to wet the sand, and then stop for 10 minutes to allow the sand to dry out, and then repeat as long as the wind continues to blow. Using this sequence of on/off will reduce sprinkler run times from 60 minutes an hour, to 20 minutes an hour. This will use 66% less water, and considerably less pump time.